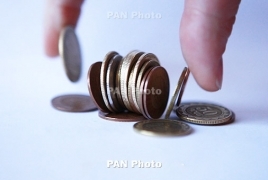 PanARMENIAN.Net - In the first quarter of 2019, tax revenues grew by 24% against the same period last year to amount o AMD 296.5 billion. According to head of the State Revenue Committee David Ananyan, AMD 239.2 billion was collected in taxes in Q1 2018. Ananyan had earlier met Prime Minister Nikol Pashinyan who revealed in a Facebook post published immediately after the meeting, that the budget collection plan for Q1 was overdone by AMD 11.4 billion.